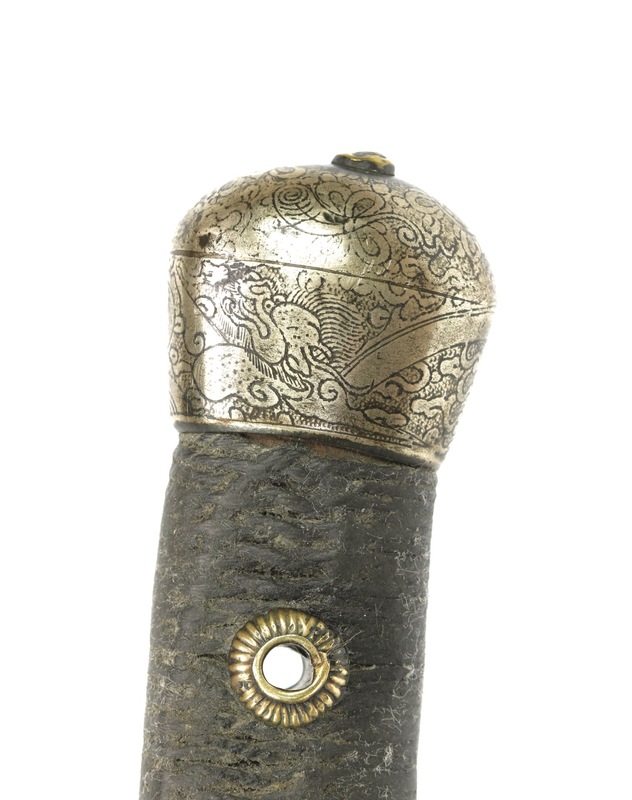 Apart from the standard regulation pattern sabers of the Qing military, the record of antiques shows quite a variety of high-quality, non-regulation pattern sabers. 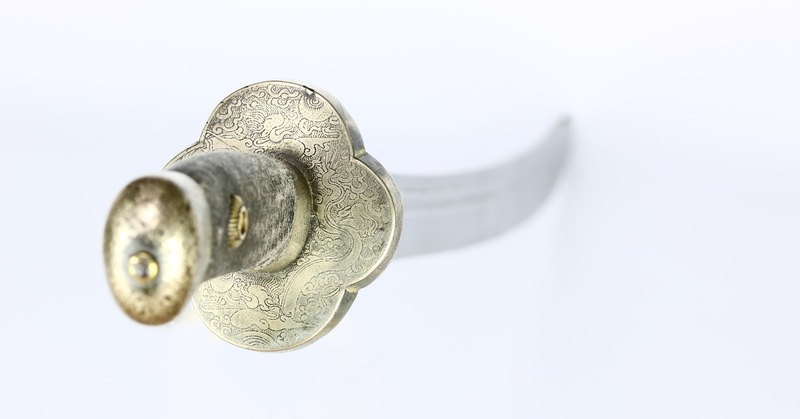 While the gentleman in Qing China would mostly wear a short or long version of the Chinese straightsword, the jian , the saber was mostly confined to military circles. An explanation may be found in the fact that as a conquest elite, anyone under the Manchu, Mongol and Chinese Eight Banners was required by law to wear a sword at all times. On top of that, the upper ranks of these military elites sometimes got considerable amounts of money to purchase and maintain their equipment. Indeed, many were likely to have had several sabers: Battlefield sabers, ceremonial sabers for special occasions, and several dress sabers for going out and about. The more delicate sabers among this group were perhaps worn with the everyday attire to meet the demands of wearing a saber at all times, without actually having to wear the heavy military saber every day. Materials: Iron, steel, baitong , copper, wood, cotton. Scabbard: Wood, leather, lacquer, baitong , copper. The saber presented here is probably such a dress saber as described above. Light enough to be worn comfortably, yet long and heavy enough to serve well in a civilian self defense environment. It has some very interesting features, both in blade and fittings. The blade of moderate curvature, with two grooves of unequal width, the upper groove being narrower. 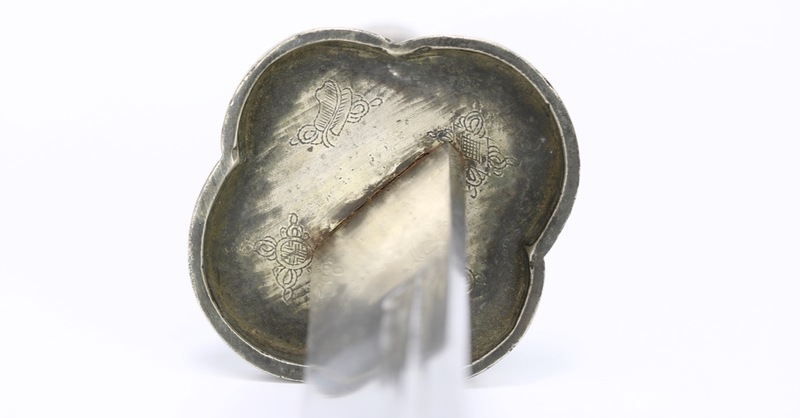 The tip is clipped, a shape described in collector's circles as yanchidao (雁翅刀) or " goose wing saber ".1 The backedge is scalloped and serrated, and in addition is engraved with a coil. Interestingly, this is a feature also found on some yanyuedao (偃月刀). It is of forge folded construction with delicate layering, with an inserted high-carbon plate exposed at the edge. In the right light, a differential heat treatment can be seen in the form of a grey, cloudy effect. It's something known from Japanese swords as " hamon ". The blade has two nicks near the tip, (see pictures), otherwise in good condition, no pitting, original contours intact. 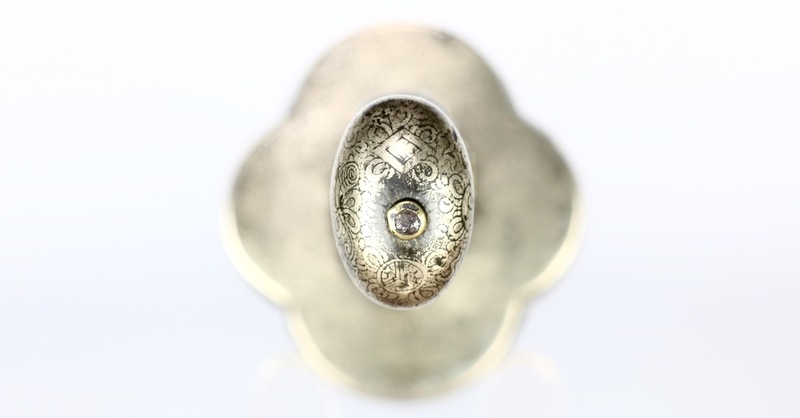 It comes with its complete set of fittings in thick gauge of "nickel-silver", called baitong (白銅), also known as baktong in the Cantonese dialect. 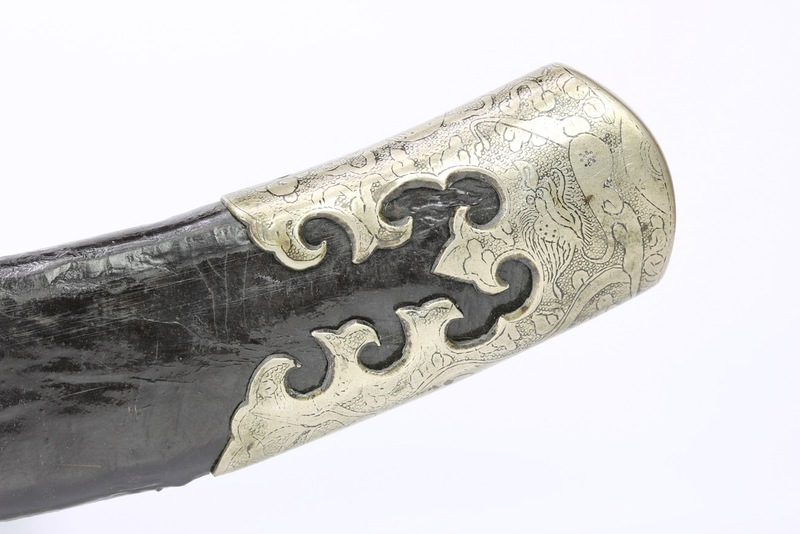 This material is an alloy of copper, nickel and zinc that is thought to have been used by the Chinese as early as the 10th century A.D. where initially the alloy was found Yunnan.2 The Chinese have sold ingots of the material to the western world since 1597, until the western world figured out how to make it themselves in the 18th century.3 Now, it's more commonly known as "German silver" as it were the Germans who first started to produce it in commercial quantities. During the Qing, export of the material was forbidden but was nevertheless smuggled plenty in East Indies maritime trade. 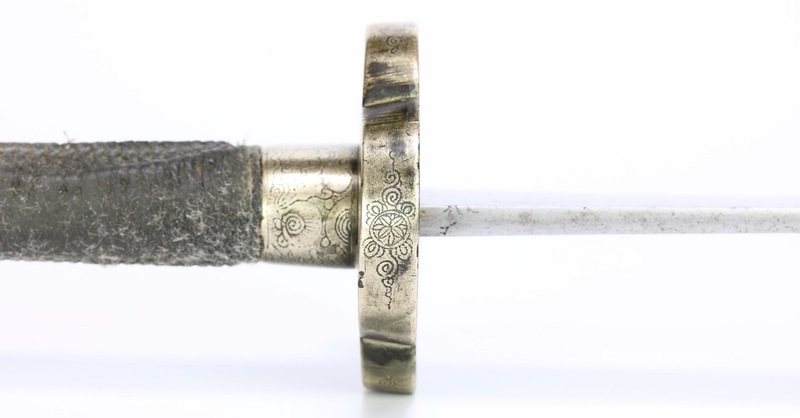 The hilt consists of a quatrefoil cup-guard with raised rim, engraved on all sides. Dragon chasing a the tama or "sacret jewel" on the bottom, and various traditional Chinese auspicious symbols on the rim as well as inside the cup. 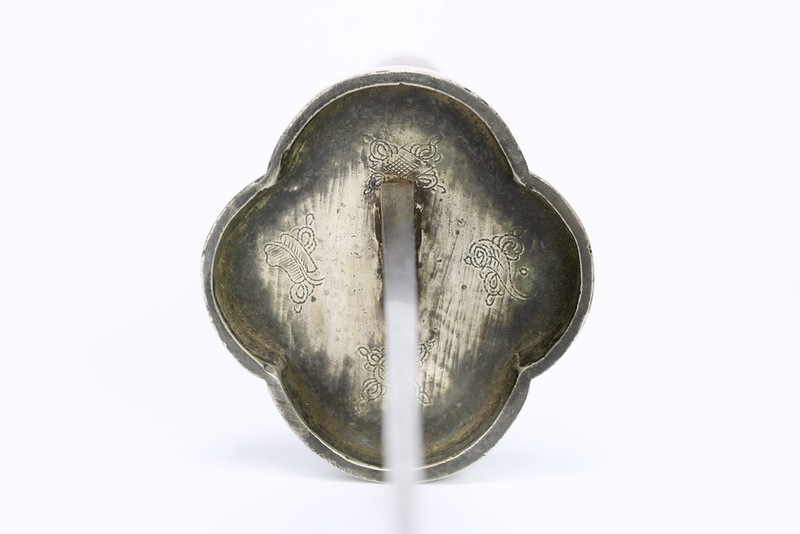 Pommel and ferrule are executed in the round style, with the pommel being a transitional style between the typical 19th century yuanshi (round style) but with a profile much reminiscent of earlier Qing fangshi . It retains its original wooden handle and original grip wrap. Original peening at the pommel still undisturbed. 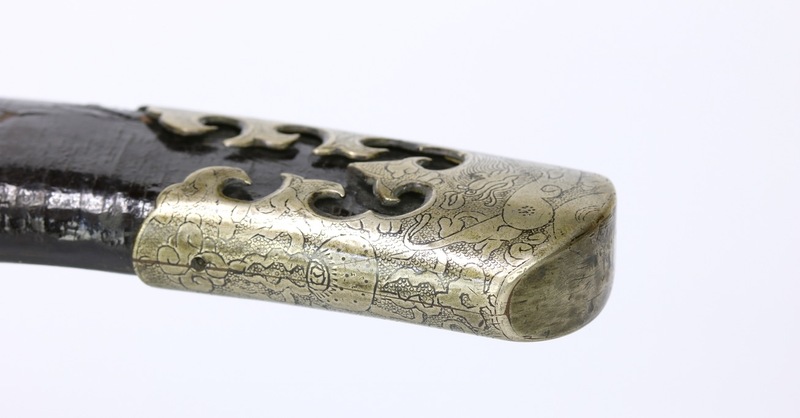 Pommel and ferrule are also engraved with scenes of dragon chasing the "sacred jewel", as well as other auspicious symbols. The scabbard is all original, of wood covered with black lacquered leather. 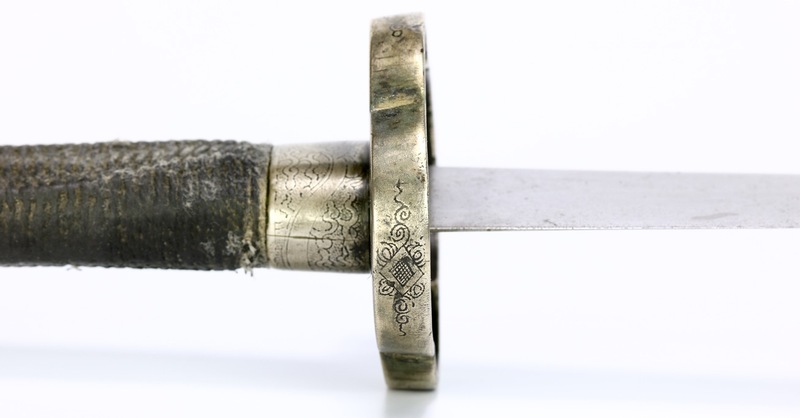 Scabbard in good, original condition, no recent repairs. Some minor losses to the lacquer. Scabbard fittings also of baitong en-suite with the hilt fittings. 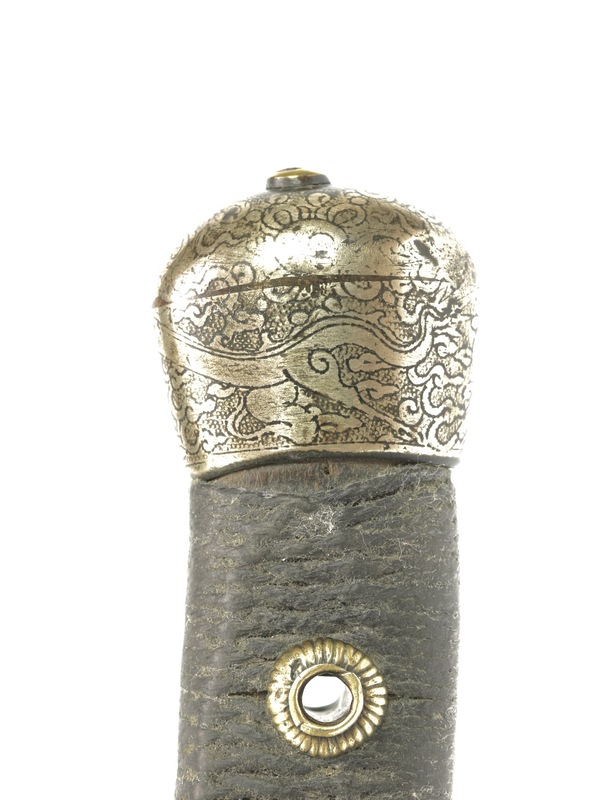 Of thick gauge, mouthpiece and scabbard endpiece with elegant cutouts representing stylized clouds. Both are decorated with fine line engraving, again representing dragon chasing "sacret jewel" The suspension bar is decorated with dotted lines, riveted to the suspension bands that are decorated with dragon. 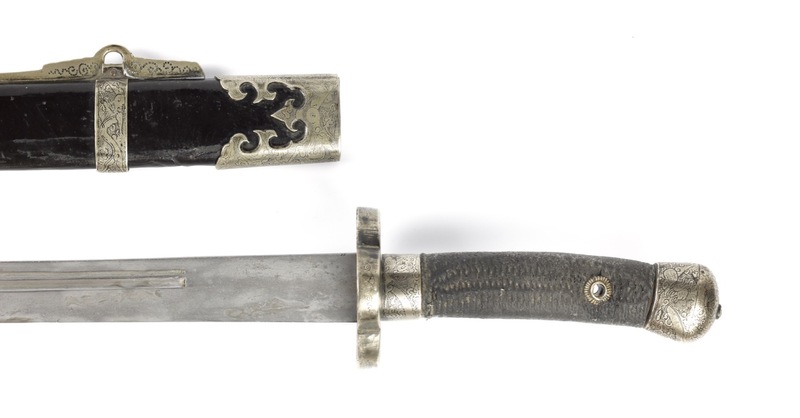 The 19th century is generally considered the decline of Qing sword making, where styles got increasingly formulaic and repetitive and skill declined rapidly as the decades passed. 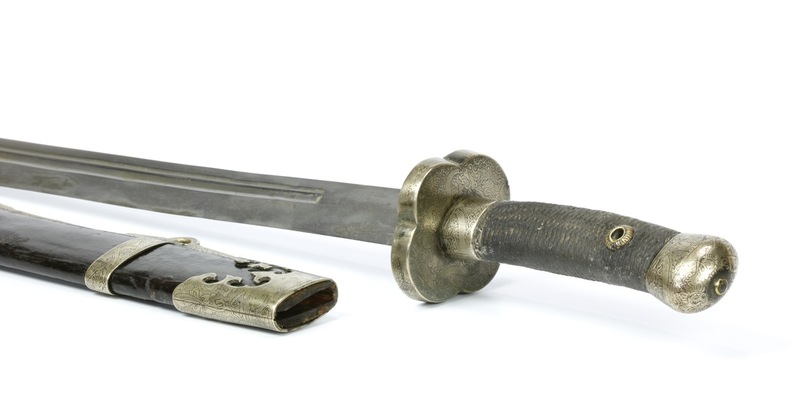 This wonderful saber exhibits a creativity and skill that was more common on swords of the preceding 18th century. 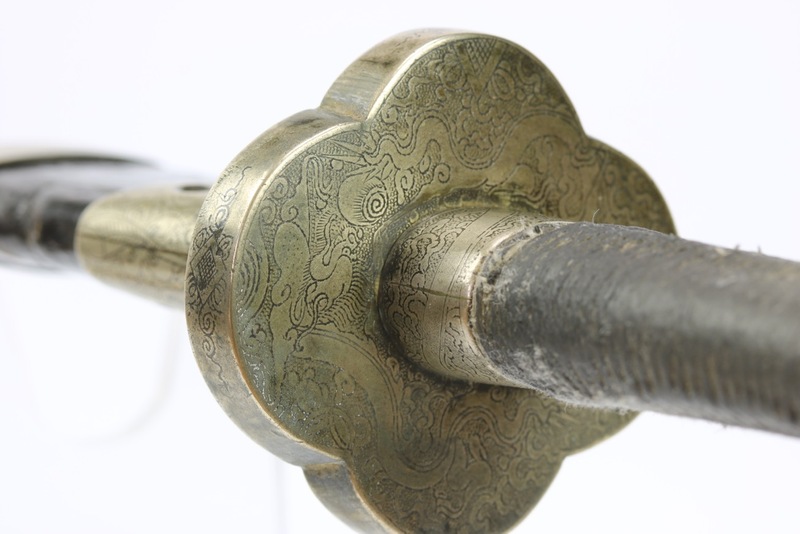 Its hilt style, rare blade style, rare baitong mounts, make it stand out from most sabers of its period. 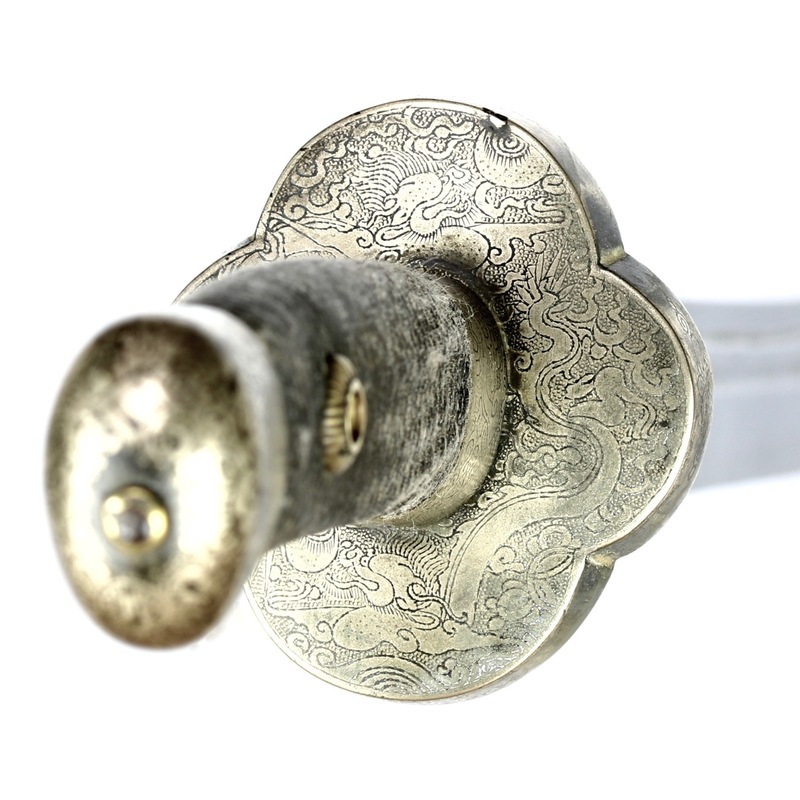 The quality of the engraving is exceptional, finely executed and showing a creativity and a flow of hand that is unusual on Chinese arms. 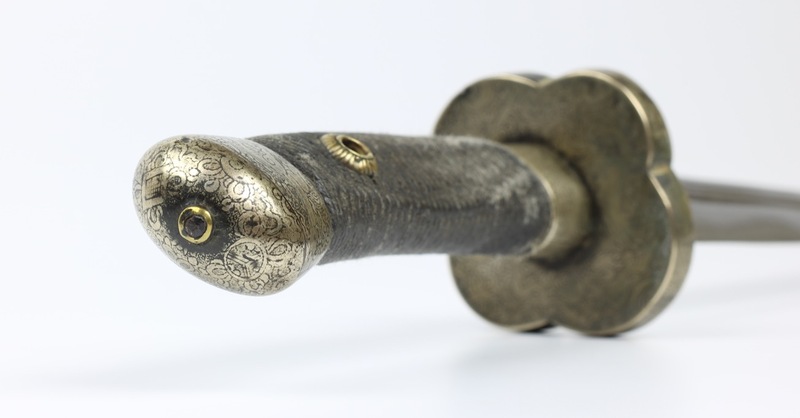 A valuable addition to a serious collection of Chinese sabers. 1. 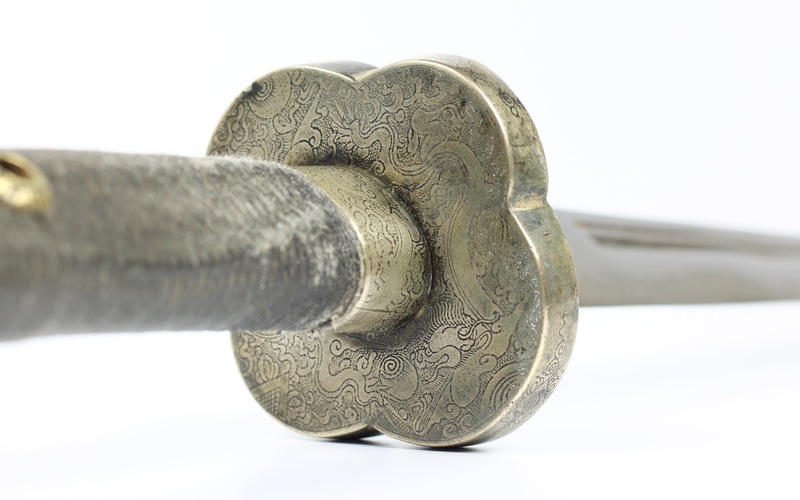 See my article: A Chinese saber typology elsewhere on this website. 2. Joseph Needham: Science and Civilisation in China, Vol 5-22: Chemistry and Chemical Technology , page 190.